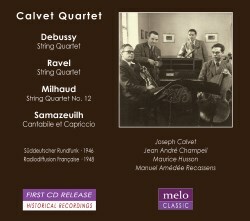 The Calvet String Quartet was formed in Paris in 1919, and over the next twenty years developed a reputation for its technical polish, refinement and informed musicianship. In fact, it came to be regarded as the finest European quartet together with the ProArte Quartet. In 1928, the ensemble scheduled their first Beethoven cycles at the instigation of Nadia Boulanger. They had missed out on the 1927 Beethoven Centenary, intimidated by the established reputation in Beethoven performance of their rivals, the Capet Quartet. In 1940 the Calvets disbanded, with two of their personnel going their separate ways. In 1944 the new Calvet Quartet re-formed, but only remained in existence for another six years. In 1950, due to Calvet's health problems, the quartet disbanded. He was to live another thirty-four years until 1984, and in that time he was to pass on his expertise and knowledge to countless musicians. I am not at all familiar with the Calvet Quartet, and this is my first encounter with their playing. My research tells me that they recorded both the Debussy and Ravel String Quartets commercially in the 1930s. These performances have been issued both on LP and CD (Lys). On this live radio broadcast, the perennial pairing derives from August 1946, in the ensemble's final incarnation. What strikes me in these performances is the idiomatic sense of style they bring to the music. Tempi are comfortable, and phrasing is natural and instinctive. Debussy's Quartet is more passionately intense, with an underlying dramatic intent. In the Ravel, the impressionistic elements are emphasized. The players are highly sensitive to the infinite subtleties, nuances and inflections within the both scores. Each work employs pizzicato passages in its second movement. These are especially successful, with the plucked strings resounding warmly and distinctly. The other two pieces, by Milhaud and Samazeuilh, were taped two years later, in November 1948. The String Quartet No. 12 by Milhaud was written to commemorate the hundredth anniversary the birth of Gabriel Fauré. It has a gorgeous lyrical slow movement, the emotional heart of the work, which the Calvets savour to perfection. The opening movement is sunny and joyous. The finale, lively and genial, is played here with scintillating virtuosity and aplomb. Ensemble is stunning. Gustave Samazeuilh may not be known to many. Born in Bordeaux, he studied initially with Chausson, who died prematurely in 1899. He then transferred to d'Indy and Dukas. The impressionstic complexion of his music clearly shows Debussy's influence. The Cantabile and Capriccio for String Quartet dates from 1947, a year prior to this recording. The Cantabile, as its name suggests, is steeped in beguiling lyricism. The Capriccio, in contrast, is spirited and vivacious. Impressive is the pristine articulation of the pizzicatos in the latter. One can appreciate, listening to this, why the ensemble was lauded for its technical prowess. For those who understand French, there is Joseph Calvet's short interview, recalling his meeting with Ravel. The sound is a little recessed and dim in the Ravel and Debussy, but less so in the later airing. I found the notes by Michael Waiblinger particularly enlightening. I may be a first-timer to the Calvet Quartet’s playing, but I now count myself a convert.